Top Five Male Characters of Fate – Anime Reviews and Lots of Other Stuff! So, I am back for the second, or would it be fourth post in this collaboration with Deven. Well my second post of mine. In total it is four posts. Anyway despite still being disappointed in myself with my inability to make a good logo for my top fives in paint, here is what will be the last one in general for a few months while I gather ideas. Kind of glad it is part of a collab. On my blog all parts can be viewed on the collaboration page, where if you would like to do one with me it is as simple as a comment and being a blogger. So, before I begin thank you Deven for doing this with me it was fun and I hope you had fun too. Is it weird to put him at the bottom of my list, the one I relate to the most. Personally I do not think so. I mean to me I view Shiou as a sort of inspiration. His character can say a lot. I bring this up a lot when I bring up his character on how his lines can sometimes become easily skewed and out of context or lost in translation, but it is those lines that mean a lot. Even standing up to be that “Hero of Justice” means a lot to me. I was in a similar situation and want to be a person that stands up for what is right, in my writing I want to inspire hope, much like heroes do. So, yeah, like always not sure where to cut off with this. Typically I do what I want and put two characters and count them as the same number. Well this time I decided not to, mostly because I am not allowed to use one, I mean have no back up character in place. I cannot really pick one over the other on who I like more. The thing I like most about them is that Bromance aspect. The two are simply amazing together. Rider is amazing in his own right. I always view that the Rider class is the weakest, this is mostly because their power comes from what they are riding, well I mean this was back when I first got into the series over two years ago, in truth there is no real weakest class. 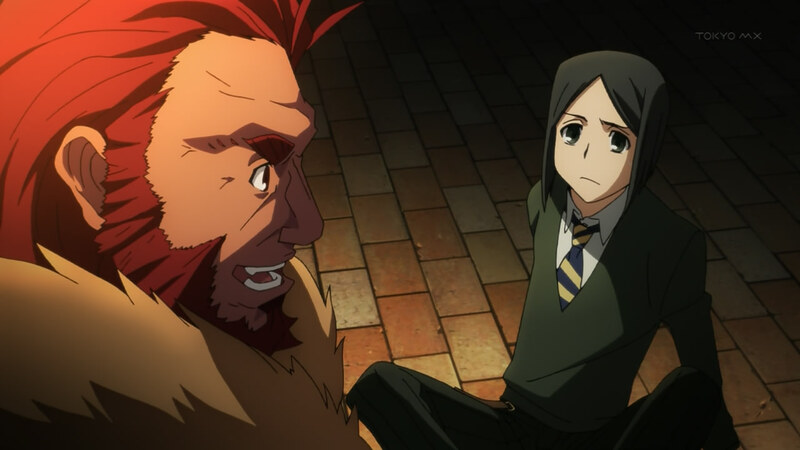 Even then Waver is also equally amazing since he is the underdog like character and does not really think he can make it far into the Holy Grail war, yet he does. The two separate are equally as amazing as are together. Long live the Bromance. Does it count as Shirou being on here twice since his possible future self is on this list and is higher than him? Anyway originally for my notes from about a month ago had Lancer on this spot, not sure why and I kind of wish I would put more notes down on why certain characters are in certain spots. Anyway, enough about the obvious tangent that I do and continue on. 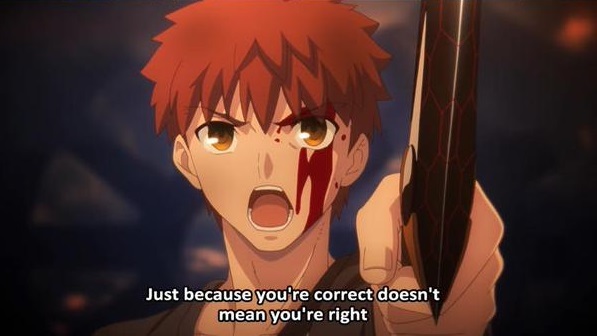 On one hand Archer is plays somewhat of a villain in the Unlimited Blade Works route. He is mysterious yet still manages to be amazing. He is cool, and heroic. I do like the concept of him compared to the others where he comes from the future. Although it was used for him, it would be interesting to see something along the lines of it happening again in a future series, only them being companions could be an interesting twist. Anyway enough about that too. I do like the role, how he acts, and what he stands for in general. I mean he is a major upgrade compared to his younger self at times. I faintly just remembered something. (flips though conversations with Deven and realizing how long these posts have been in the thought process for) Oh yeah I am under contract to not use Gil. Well time to go for the real number one. I love how the person that inspired Shirou to be that “Hero of Justice” was well not really one. That person that took him in was partially responsible for being the main cause for his amnesia and his main inspiration. That and Kiritsugu is just amazing. One hand his wife, being equally amazing. On the other he is seemingly the polar opposite that Shirou makes him out to be before they meet. He is cunning and manipulative, going as so far to not be Saber’s real master and using his wife as the proxy, as well as killing several of the masters in the process. Sometimes I love the villain as much as the hero, which is why Gilgamesh was originally going to be here. 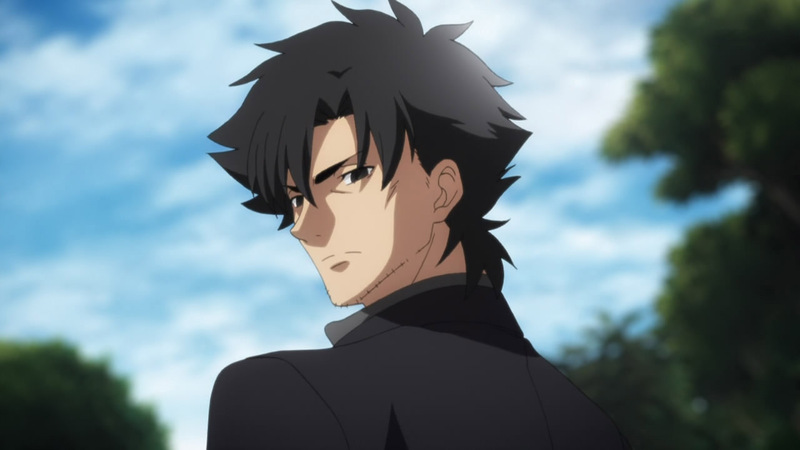 But Kiritsugu is just an amazing anti-hero, which is if you could call him that. I mean he is known as the Magus Killer, and although he wanted to be a hero of justice he knew he would need to get his hands dirty in order to do so. He was just amazing throughout it all, and I really want to go and rewatch Fate/Zero now since most of the characters on this list are in that series. So, I hope you like this. I would like to thank Deven since this was a fun little thing to do. Deven’s post cans be found on my blog here.